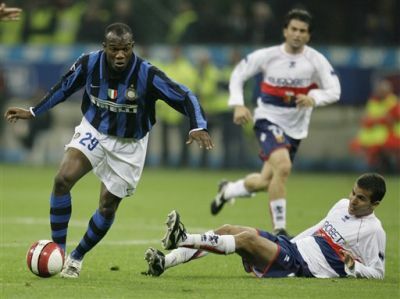 Not Klaas Jan Huntelaar of A.C. Milan but the central-striker of Inter: David Suazo must become our goalscorer for the rest of the season. The 30 years old player of Honduras will be rent the next 6 months, while our present striker Sergio Floccari will be hired to Lazio for the rest of the season. Suazo can play his first match Wednesday 6th January in San Siro against A.C. Milan, the team that wanted to buy him 2 years ago. Huntelaar in Rossoblu? Bussy month January! The playersmarket starts oficially again at Saturday 2nd January. According to the rumours in the newspapers Genoa is close to buy playmaker Fernando Menegazzo of French number 1 Bordeaux. The journalists also write in their daily papers that Genoa and Milan are close to a transfer of Klaas-Jan Huntelaar to Genova. The former central-forward of Ajax and Real Madrid wants to have more playminutes to stay in the Dutch National team at the Worldcup next summer in South Africa. While the sun was shining and the temperature already climbed till + 7 the news arrived that the match Genoa-Bari was cancelled. Everybody was surprised because the last snow fell down on Friday-evening and since then it was only cold but dry. Officialy the match is cancelled because the entrances and the stairs of the stadium are still full of ice, so it is too dangerous to the public. Others think that the real reason is the great number of injured players of Genoa after the battle against Valencia last Thursday. The match probably will be played again at Wednesday 27th January. Genoa lost the deciding match against Spain’s number 3 Valencia in the 95th minute by 1-2 at the moment the complete team tried to score the necessary winning goal. Especially in the 2nd half our team played very good which lead to the 1-1 equalizer of Hernan Crespo in the 51st minute. Because Lille beat Slavia Prague our red and blue boys had to win to stay in Europe after the winter, so the 1-1 on the scorebord was not enough. A fatal error of Alessio Scarpi who passed the ball towards David Villa meant the end of Genoa’s European adventure 2009-2010. Let’s hope we return sooner than the 17 years between 1992 and 2009. The final standings of group B with the number of Uefa-points at the beginning of the season. Today the drawings in Nyon (Switzerland) brought nr. 2 of group B Lille with Fenerbahce, while the winner of this match will play against Liverpool …..
Tomorrownight at 19.00 hours everybody in Holland can watch the deciding match of group B of Europa League: Genoa-Valencia on Eredivisielive. This TV-channel usualy shows all the matches of the Dutch Serie A (Eredivisie) choose Luigi Ferraris as the most important stadium for tomorrow’s matches. Genoa misses the injured Sokratis, Esposito, Kharja, Modesto, Figueroa and Jankovic while Fatic is not on the Uefa-list. Genoa lost the match in Stadio Olimpico of Rome against Lazio by 1-0. The only goal was scored by Kolarov in the 40th minute in the 1st half. The last 28 minutes Genoa had to play with only 10 players when Salvatore Bocchetti got the red card of referee in the 66th minute. One minute before referee Celi refused to give Genoa a penalty when Kolarov stopped an assist of Zapater with his hand and 30 seconds before the red card of Bocchetti good-old Ivan Juric headed the ball on the post besides Muslera. With 10 players Genoa played better then with 11 players, but the luck and believe missed to really score the equalizer. Was Valencia already in the minds of our players ? Genoa is now on the shared 7th position in the standings with 24 points in 7 matches. Next Sunday we play the last match of this year in Luigi Ferraris against Bari. Yesterday 2 of the best football playing teams of Italy: Genoa and Parma played against each other in Luigi Ferraris. The match was spectacular and on a high level. After 14 minutes Rodrigo Palacio scored his first Serie-A goal in front of Gradinata Nord: 1-0. Twelve minutes later Raffaele Palladino doubled the score, but the goal was annulated because of off-side. Parma became stronger and stronger and in 36th minute Biabiany scored the 1-1 equalizer. With this score the first half ended. In the 2nd half it was again Biabiany who scored and brought Parma the lead. Genoa reacted immediately and goalkeeper Mirante became one of the most bussy players in the field. In the 21st minute Raffaele Palladino scored the equalizer: 2-2 with a great shot outside the penaltyarea just besides the post. Four minutes later Omar Milanetto scored 3-2, but the goal was irregulary annulated because of off-side while Milanetto was behind the ball at the moment Sculli passed it towards him. The last big chance was missed by Zaccardo who headed the ball just over the goal of Alessio Scarpi. The match ended in 2-2, which means Parma stays 4th and Genoa 7th in the standings. 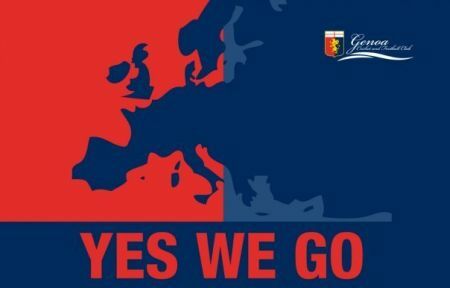 To still have the possibility to go further after the winter in Europa League our Genoa should not lose in Prague. A victory or a draw did not make any difference, in both situations Genoa has to win the last match at home against Valencia. Knowing this Mr. Gasperini decided to substitute the derby line-up players Amelia, Moretti, Criscito, Rossi, Milanetto, Palladino and Sculli while Palacio is injured. Only Biava (squalified next Sunday against Parma, just as Sokratis), Bocchetti and Juric stayed in the team and formed with Scarpi, Sokratis, Tomovic, Zapater, Mesto, Modesto, Crespo and Palladino the line-up in this 5th match in Europa League. To be honest, the match was not very attractive. Both teams had a few chances to score, but Slavia Prague could not beat Alessio Scarpi, while Genoa was satisfied with a draw. The 0-0 draw was enough to Genoa and only Palladino received a yellow card, so nobody is banned against Valencia that won the other match in group B by 3-1 against Lille. Valencia is now on top of the standings with 9 points, while Genoa and Lille both have 7 points. 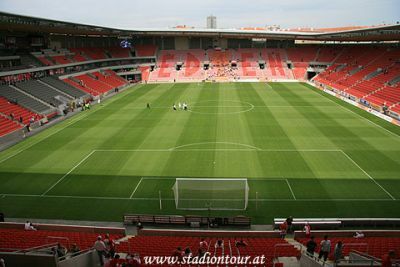 Slavia Prague has only 3 points and is out of competition, so probably Lille easily wins the last match at Thursday 17th December. With a victory Lille is automaticly qualified to the next round, while Genoa has to beat Valencia to be the other team of group B after the winter. Of course the fantastic derby is still in all our minds, but we have to make immediately space to another important match: Slavia Prague – Genoa, the 5th match in Group B of the Europa League. With 6 points in 4 matches Genoa is on the shared 2nd position with Valencia that plays in Spain against number 1 Lille that collected 7 points so far.